A huge crack has appeared in a cliff near a New Forest village causing fears of a major landslide. 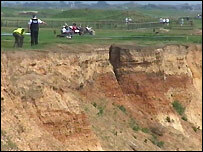 Questions were raised about whether the crack at Barton-on-Sea, in Hampshire, had been caused by the Kent earthquake. The Marine and Coastguard Agency (MCA) said "it was too coincidental to ignore" but Hampshire Police said there was not thought to be a link. A row of beach huts below the cliff face had to be evacuated after the crack appeared on Saturday morning. It is feared the crack, which was estimated to be about 300 metres (984ft) in length by the MCA, could cause a major landslide. An MCA spokeswoman said: "We do not know if it is linked to the earthquake but it is too coincidental to ignore. "If the crack does get any bigger it could lead to quite a large landslide and there are lots of very expensive beach huts below." A spokesman for the police, which cordoned off Marine Parade East, said no-one had been injured and no homes had to be evacuated. The earthquake, which measured 4.3 on the Richter scale, struck Kent at 0819 BST and experts said its epicentre was a few miles off the coast in the English Channel.